The route of the 2014 USA Pro Challenge (dates: August 18th - 24th, 2014), the professional cycling American Tour in Colorado, has been announced. In year four of the race we will see a repeat of many of the favorites with a yet-to-be-decided finishing stage. That is right, the actual route of Stage 7 remains to be decided. Apparently in some sort of gimmicky public relations marketing ploy, a desire to let others promote the race for them, or a state of total confusion because Boulder is possibly back in the mix this year (and there is no controlling any race which involves Boulder County) - race organizers are sending the vote to the people. Well this should be interesting. In a twist of tradition the race organizers have decided to place the unknown on the actual race route, because who will be wearing the classification jerseys in this race will be decided by day three. So they might as well get the people invested in the race before it begins. I'd vote for choice #1 but there is already a circuit race planned for Aspen and Colorado Springs in 2014 (so this is likely a "no" unless they want to advertise the race as a climber's circuit race). Also I don't think the riders liked that circuit too much in Denver last year. My choice would then be either #2, #3, or #4, simply because I do think it good that a stage race actually finishes - somewhere. I don't really care where, and I am thinking maybe the organizers don't care either and that is why they are letting the people decide. ...We did a good job on six stages, let it go at that, who cares about Stage 7 - the winner will already be decided after Stage 6 and maybe even by Stage 3. Let's put it to the people, go have a beer and start collecting all those emails for our sponsoring partners. I won't be voting. It's a combo of not wanting to be such a sucker and also knowing that based on the popular TV shows The Voice and Dancing with the Stars, the American people do okay in voting for entertainment. I want to be surprised. That said, Golden is a smaller city, yet quite united and already proven to give fantastic support to this race through hosting stages in 2011 and 2012. They know what they are doing and would be a good choice (although the morning light in Golden is horrible for race photography, if you want my opinion on how not to select a stage start). Boulder gave it one go in 2012, for one stage, and you'd have thought they gave birth to a nation from all the labor pains and controversy before and after. It is a shame because Boulder, Colorado is scenically spectacular and would certainly highlight the cycling lifestyle in a positive way, but the city is in constant controversy among it's residents over both this race and the recent flood recovery priorities. 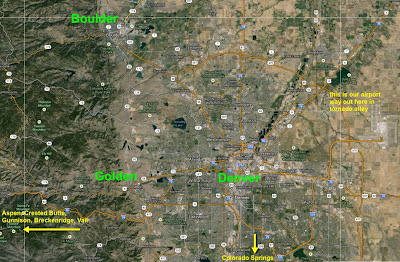 If the route could depart from South Boulder for Golden it might work. 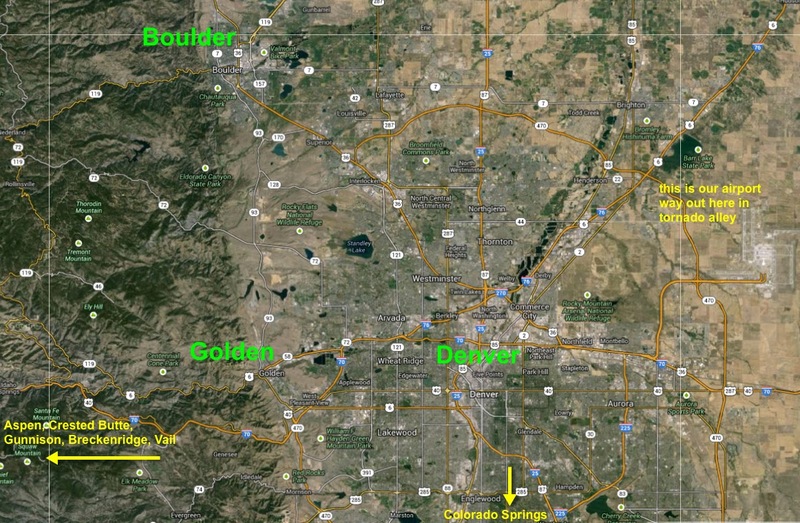 Why not start in south Boulder, ride over the wall (Coors Classic), through Golden (with a quick climb over Lookout Mountain), and then into Denver. Finish, podium, party, home. Update: Stage 7 was decided! The route will travel from Boulder, up Hwy 93 to Golden, up Lookout Mountain and in to Denver city center for a circuit. Excellent. 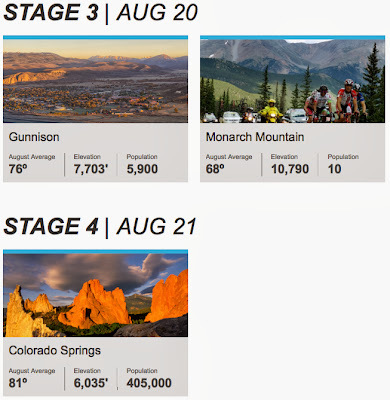 Crested Butte and Gunnison are on the 2014 route - let's hear a huge hooray! These cities are the best of mountain scenery, great riding, and united people. This is fantastic news. 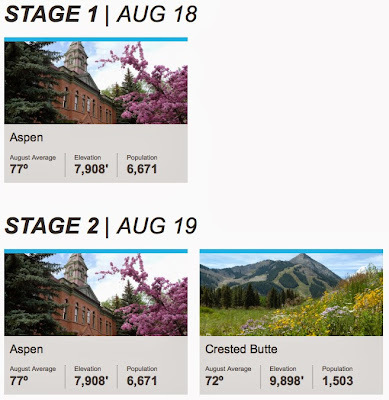 Aspen is again the starting host city for 2014, with what appears to be an exact copy of the 2013 Stage 1 starting route. The host cities of Stage 2 have been used before, but we may see an alternative route from Aspen to Crested Butte. A 104-mile route would take the riders through Paonia and over McClure pass (over dirt section) into Crested Butte from the west. Which means we might see a year without Independence Pass, which has seen decreasing numbers of increasingly partying fans over the years. I am guessing at this departure route from Aspen because what stands out as unclear is the route of Stage 3 from Gunnison to Monarch Pass. Monarch Pass is only 41 miles away from Gunnison (and that is way too short), so a good guess is that the peloton will leave Gunnison north over Cottonwood Pass through the towns of Buena Vista (sprint location again?) and/or Salida and climb the east side of Monarch Pass for the mountain top finish. This is a perfect length for a stage at 109 to 115 miles. This mountain top finish stage also falls on a Wednesday (boo). Colorado Springs will again be involved in the race. These central stages will help avoid many of the damaged roads from the 2013 Colorado floods and bring the race back to a major Colorado city. It is hard to think of this road stage race without thinking about how many towns and people's property still lay in ruin. Wonderful Breckenridge plays host again. The route is pretty straight forward along Highway 24 and 9 into Breckenridge over Hoosier Pass. 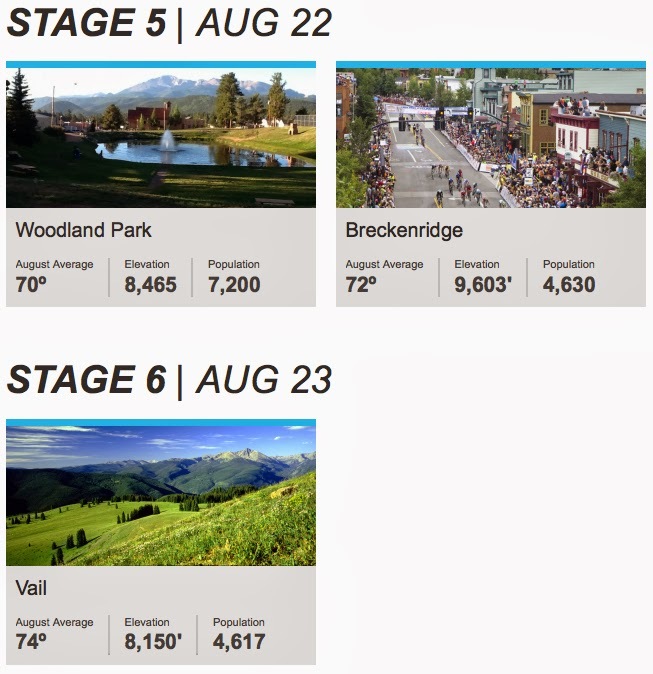 At 89-miles in length, we will probably see another repeat of the circuit around the town of Breckenridge to add mileage and drama before the finish line. The Individual Vail Time Trial is back, but this year it is on Saturday! Let's wait until after the 2014 rider transfers are complete, the Giro and Tour de France have passed. We need to see who comes to the Tour of Utah in 2014 and which teams are selected for this race - and then we can talk about winners and losers. I think it strange that all the race promoters provide us with is average temperature, town elevation and population. Who cares about that? We want stage length, elevation gain, major climbs, total climbing and grades. And most importantly - who is racing. When the Grand Tours announce their routes there are fly-over maps, climb profiles galore, and riders sitting in the front row of the presentation looking very nervous. That is all good stuff, anticipation is half the game for fans. Where will you see the race? I highly recommend going to Aspen the weekend before the race starts to see all the fun and ride on the roads with the pros (plus the pro riders loved visiting Aspen where the mood was excellent last year)! I also recommend staying over in Crested Butte or Gunnison if possible. Maybe schedule a half work day on Friday so you can see the finish in Breckenridge. And of course the Saturday Vail Time Trial. And that is it. Come visit Colorado in 2014. Stage 7 Description: Beginning in Boulder, which served as the Stage 6 finish in 2012, the race will travel through Golden, which saw record crowds as a start city in 2012, and finish with three laps around the State’s Capitol, which has served as the finish location every year of the race. The day also incorporates an incredibly challenging and fan-favorite climb on Lookout Mountain. Race Organizers gave the fans 1 month to vote and select the general route of the final stage of the 2014 race. Given the choices of various starts and finishes involving Boulder, Golden, and Denver - the final route will include a variation of all of the given choices.